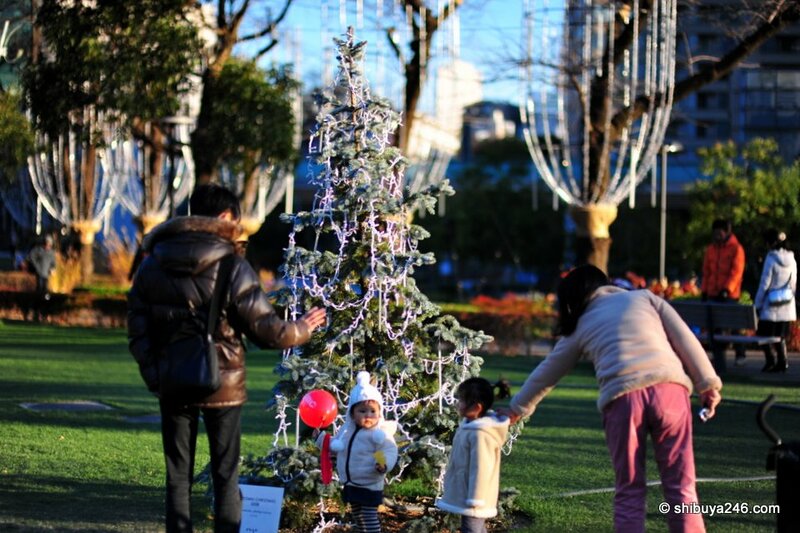 Small kids checking out the Christmas tree decorations in the park. An interesting statue at the end of the park at Tokyo Midtown. Family outing tells its own story. Nice green grassy areas in this park. Reminds me more of an English garden than a Japanese park. There are some beautiful trees, mixed in with the grass to provide great views of the buildings beyond. Nice water feature for people to walk past and enjoy. A father carries his child through the park. The pace of life seemed slower and more tranquil here. You can walk your dogs here as well. Kids playing in the park with their parents. Interesting roof line architecture in the background. King of the Midtown jungle. There were different types of illuminations on display. Some high in the trees, others low at ground level. 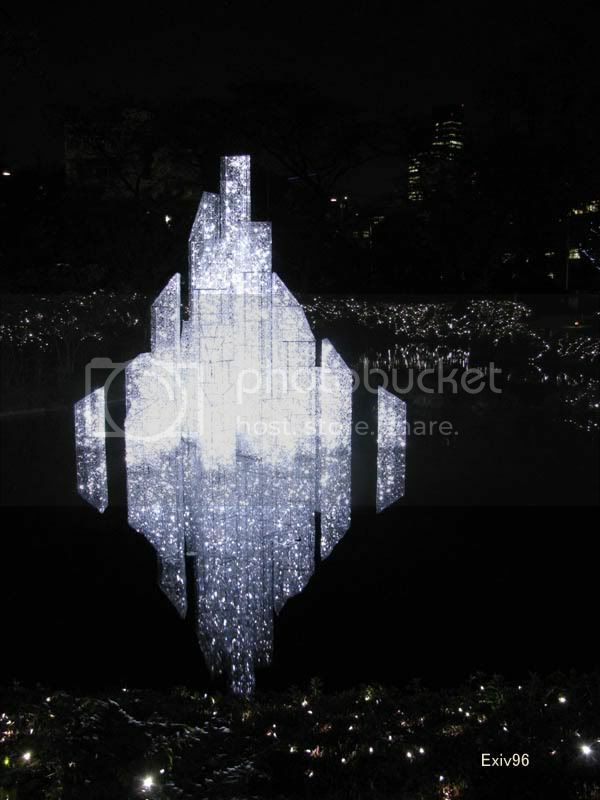 Part of the illumination display at night, also interesting to view during the day. The main street in front of Tokyo Midtown prior to getting dark. Trying to catch the water as it laps over this window frame at the Midtown complex. A couple walk by one of the many statues in the complex. Tokyo Reflections from the Midtown shopping building. 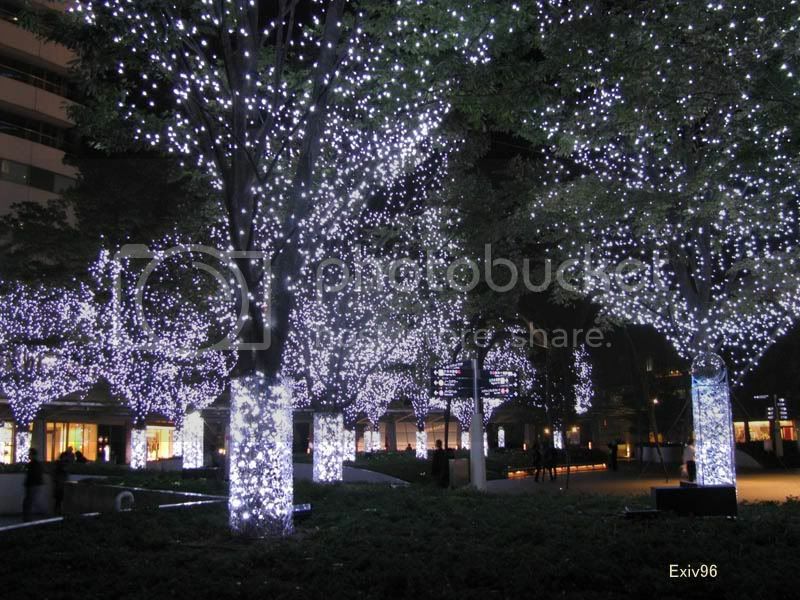 These trees were all lit up at night in a white and yellow color. The main park area was covered with these blue LED lights. Looking at a low angle the lights take on quite a different scene. The sea of blue LED lights waiting to be lit up after dark. These lights were small, but with so many of them they made a great spectacle at night. Some of the small LED lights that will light up the evening in blue later. Looking back at the Midtown shopping complex. The illuminations at night were quite spectacular. You can see some of the night time photos here, and also the Santa Xmas tree. Pretty! Are the lights a short-term thing, or permanent? the lights are just short term for Christmas, but there are various events going on at Midtown throughout the year. The park looks nice in the sunshine. Unfortunately for me, the weather was grey and dull when I visited it in November. Not many people walking in the park either, I guess they stayed inside the tower’s shopping center. So I took a few photos, and continued my walk to Tokyo Tower and finally to Roppongi Hills. Here’s a sample of their Christmas illuminations. #3 #4 #10 – same kids. well spotted. i hadnt noticed that. I thought it was intentional. First caught running, than photographed by mother, and going through the park. Again, nice streak of photo shoots until now. Thanks! I haven’t tried any tiltshift photography yet but would like to give it a go. via @Shibuya246: Tokyo Midtown Park, Japan Photo-Post | Shibuya246 http://bt.io/CLLb A nice bright and sunny day to enjoy the park. The park looks so much different during the day compared to the nighttime. Why is the color blue used so much in the lighting? Compared to the traditional colors for holidays. Photo #13 looks like a bunch of ping pong balls on display. So that’s the kitty cats domain. wonder if he ever got tangled up in all those wires? And those sure are some different looking art sculptures. wonder who designed them? Thanks. Not sure why the blue is used so much. Maybe it works well with the LEDs 😉 Enjoy your weekend. found the daytime photos more interesting than the nighttime photos of illuminations – did a lot of night photography when I was a student at UCLA – used B&W and a lot of color transparencies. Saw a photo of a tilt-shift sens on dc.com; CGM night ?? I agree. I much prefer the daytime photos. For night time I might have to try using a tripod and change the speed to get more light in. Anyway, daytime is warmer as well so definitely better for me 🙂 I will give tilt shift a go, but might have to use software rather than lens because they are quite expensive. I’ve been going through your blogs and I have been thoroughly enjoying your photos. You’ve got some excellent street captures, your images make up a really nice portrait of life here in Tokyo. You may know I got a new Sony laptop for Christmas so I have been totally buried in that and getting to the point of setting it up to where I am at right now. Last night I was finally was ready to install Windows 7 upgrade from Home Premium to Ultimate. However all of your Tweets were coming in ever morning on my cellphone when I turned it on. Between you and Yahoo with some Paretologic on the side my phone is singing all day. Soon I should have more time to spend on your wonderful work. It seemed like Yokohama was good. It seems like y’all had a great end of year, beginning of year along with Christmas as well. Keep up the great work Alan, I totally into the current Sumo tournament now, do you think you might get to a basho?